'The Struggle Is My Life'. 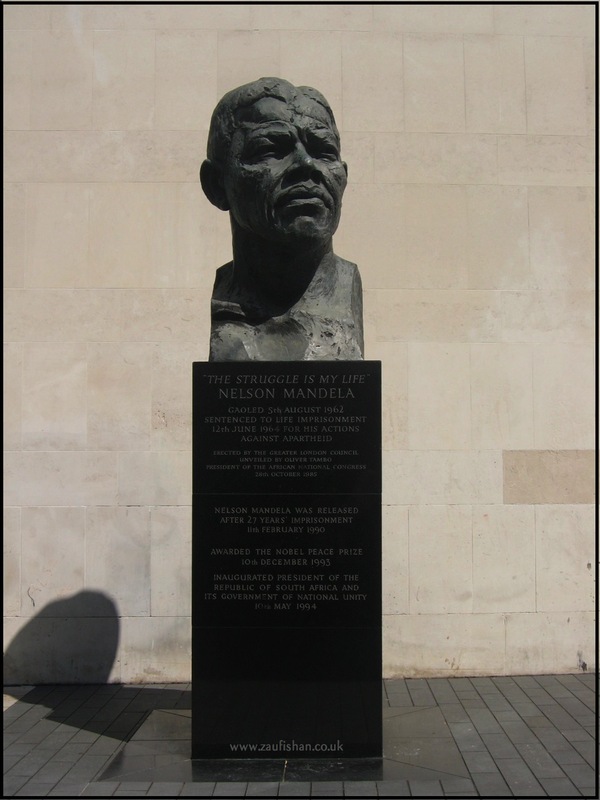 Nelson's (smaller) column in London commemorates 27 yrs of imprisonment of a Nobel Peace Prize Winner and President of S. Africa. 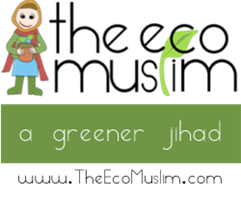 Jihad to the max. Right click and open photos in new tab or new window for higher resolution. So I ask this woman what she's painting: "Scaled representations of classical, renaissance and impressionists artwork." Cool, how long has it taken: "Well, the first piece alone took over 3 weeks as I complete a section a day." Are you getting commissioned: "No, this is my independent work as an artist, it depends on what passers-by wish to donate." Ok, so, why: *sigh* "I enjoy the time and detail." Three Words: GET A JOB. Seriously though, amazing painting. 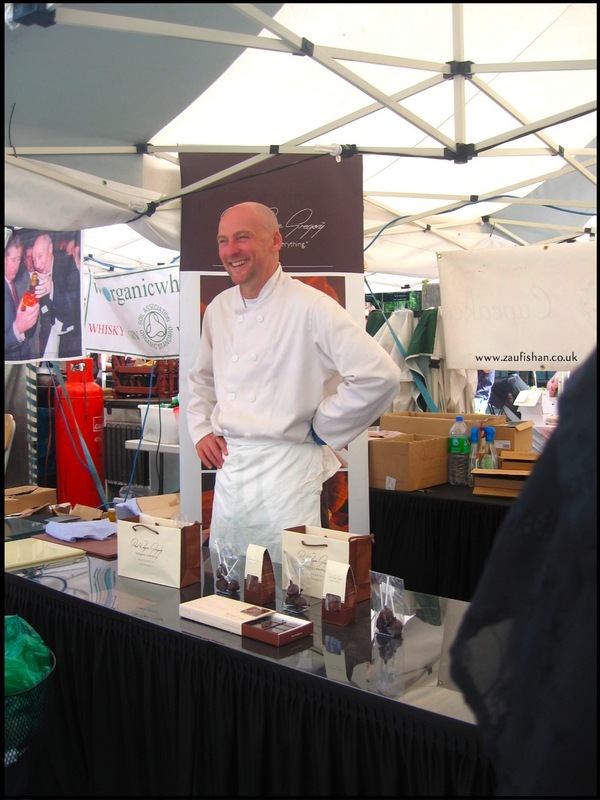 This dude is famous for his chocolatier skills, having received michelin stars or whatever they give out to approve outrageously priced foods. 5 truffles in plastic-wrap that probably cost a year and a few quid to make. Whut? I didn't even get a free sample. Pfft to that. Cupcakes, yeah baby! Peggy's assistant gave out free samples. 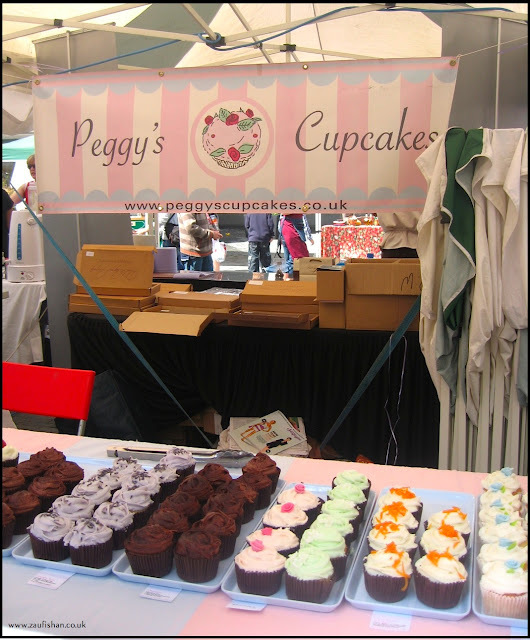 You can order her (also somewhat extravagantly priced) cupcakes for special occasions: PeggysCupcakes.co.uk. Watching this family-ran-stall cook their Moroccan cuisine with fresh spices in front view was an exciting experience. The aromas literally violated the senses, without an after burning sensation. But it was good food, alhamumdulillah. 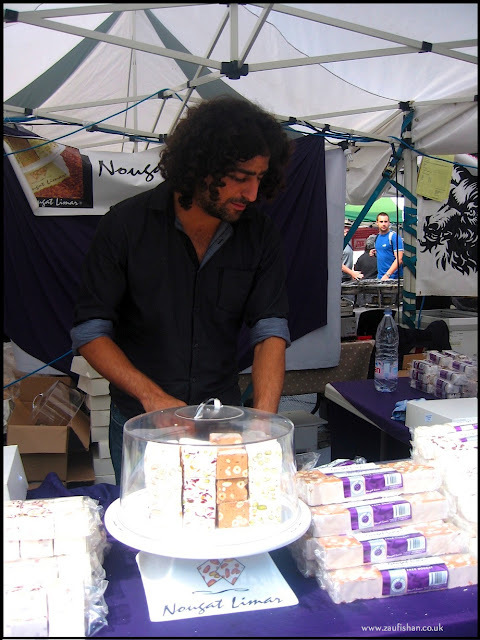 I gotta get me a Moroccan friend. Exhibit B: Mo-ham-mad Al-ee. 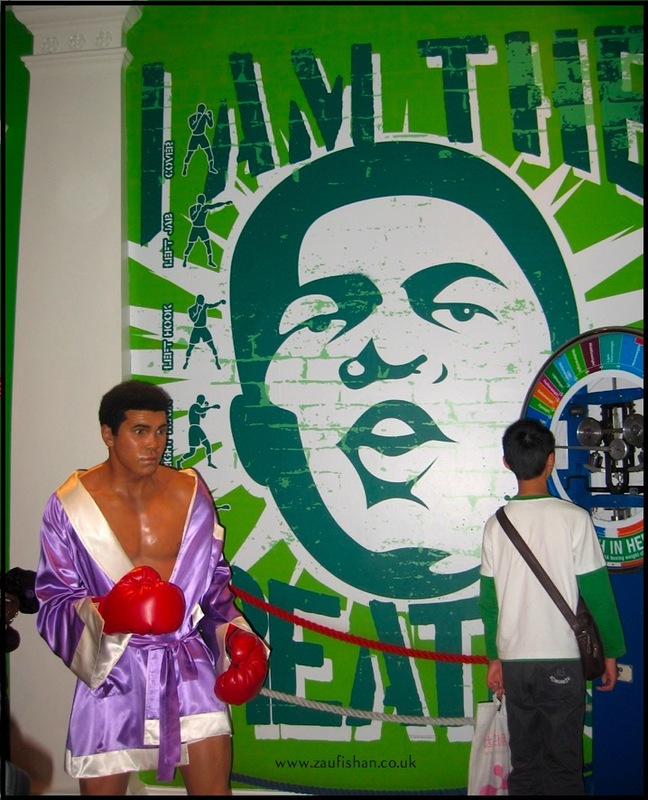 I like Mohammad Ali, my parents watched him box with keen support. I hear the song, 'Cassius, it's over, Cassius away', playing in the background. Exhibit C: Other people's shots. Actually, the shrugging woman came into my shot - I was trying to get a photo of the man behind her who made (obscene) gestures to her Majesty, the Queen of England, Elizabeth 2nd. 'Twas funny. I'm not patriotic enough to defend Liz, I'm sure she's cool. Exhibit D: Other people's shots. That woman groped MJ. As we visited Madame Tussauds after MJ had passed away, the reverence-o-meter was higher than normal. I was hoping someone would bust a cr*tch-move, moonwalk or screech an 'ow!' vowel, but nothing. 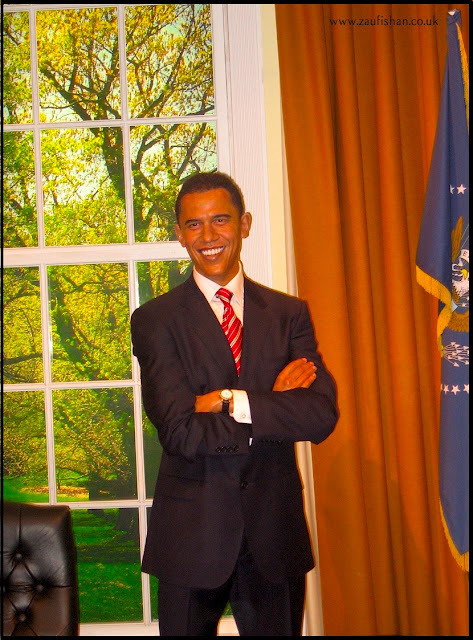 Exhibit E: Guess which man's fake. Go on, guess. Man on right: dancing man, quite invasive, he looked at me funny and tried to shimmy with the little girl in pink. That was just wrong. 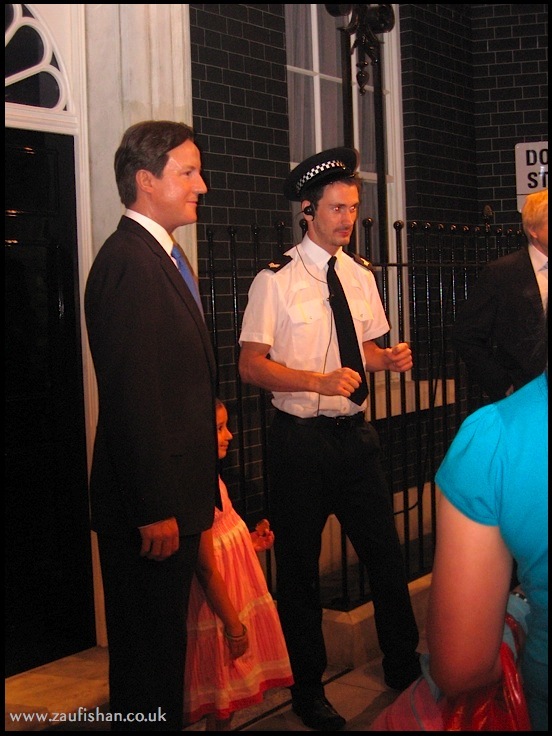 Man on left: wax David Cameron, Cambridge material, Prime Minister, a little full of himself, not a popular or understood leader here in the Ukay. However, it's not Bush, therefore alhamdulillah. Exhibit G: Mohammed Yasser Abdel-Rahman, aka Yasser Arafat, former president of Palestine. I have some respect for this man, may Allah grant him peace, he faced difficulties, was an okay-ish leader to his people (some say great, others say bad) - they loved him - and he defied USA authorities. We never meet people but we're quick to infer that their souls are bad from what others tell us. Want to know what's really dubious though? 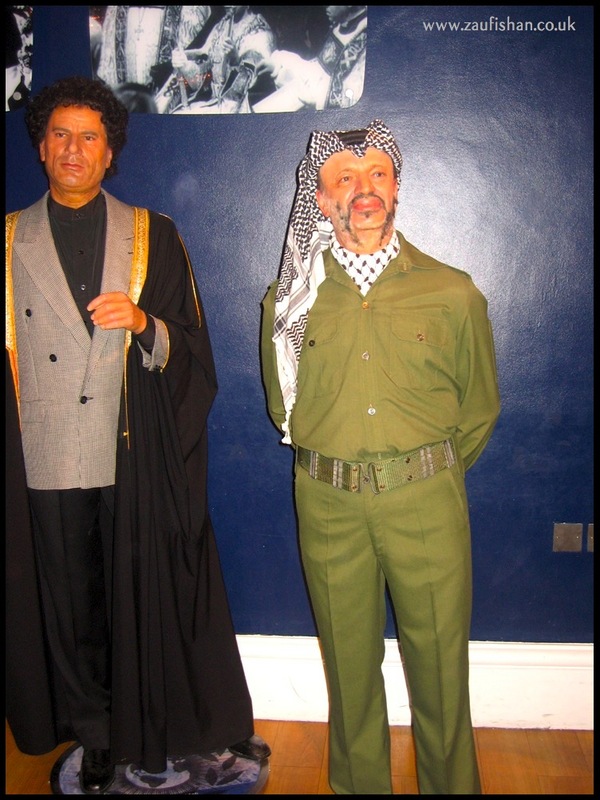 Madam Tussauds placed the wax model of Arafat, along with Gaddafi, in the villain section next to Hitler and what may have been the Devil. How's that for politics? Ma'sha'allah, I love these types of posts! Amazing paintings indeed. Yummy chocolate, cupcakes and Moroccan food!! Mmmmmmmm! 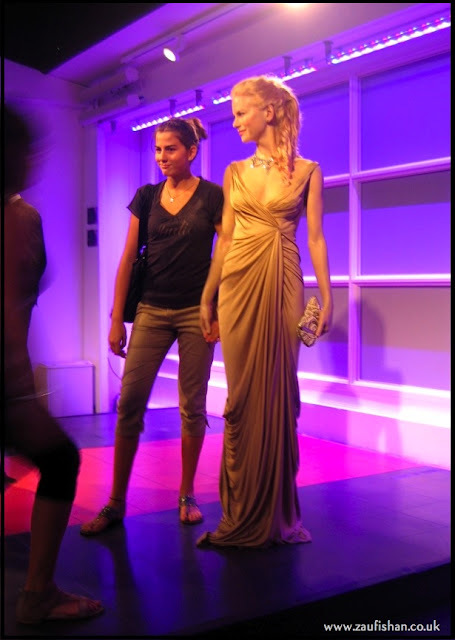 Yeah I've been hearing Merkel and Cameron I think saying multiculturalism has failed in Europe . . . . . .
Madame Tussauds - I have lots of memories there and yes, lots of pictures of MYSELF next to the famous wax peoples. Ooooh! I forgot to tell you - I saw the man himself - The Greatest - Muhammad Ali, in person last summer @ Gala dinner for Parkinson's (close family friend got diagnosed with the early-onset form). To'ally expensive but got to meet my favorite basketball stars. Course, saw Obama here in Prague a few years back. Why is it that Brits pronounce (BBC reporters for example) his name with a bit of an 'r' sound at the end? Annoying. Yeah, what kinda politics is that - Arafat doesn't belong with Gaddafi, that's for sure! "May" have been the Devil? LOL! You crack me up pagli! Hmph. 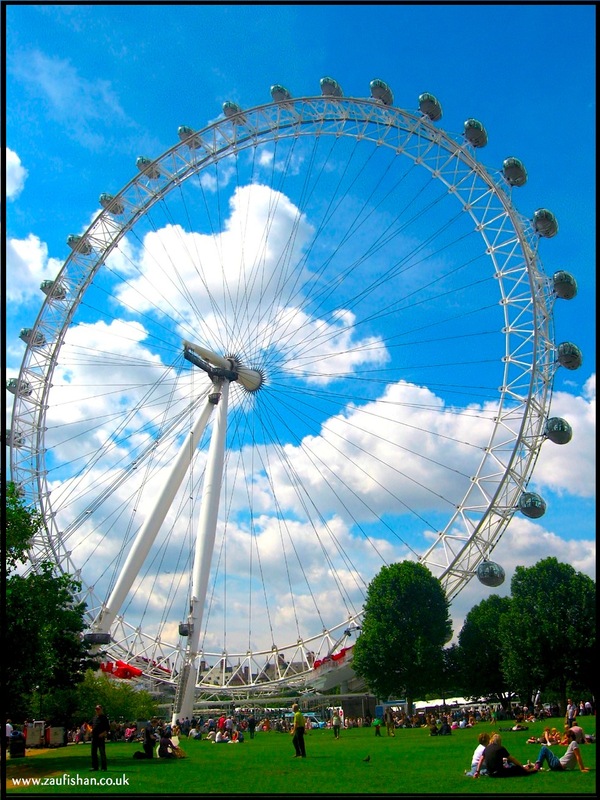 Haven't been on the Eye yet myself in the several trips I've made there in recent years - heard the tickets are expensive (hurray for Aunty grabbing the free passes, smart woman she is, alhamdulillah!) I definitely wanna see London from up above once. Must be beaui'ful. Alhamdulillah. 'Twas cool, all in all. We have this attachment to travelling the world and getting wide-eyed over temporary stuff. The things I find that makes a trip phenom is (1) who you go with - i.e. the people you love, (2) your intention for travelling and (3) the impact you have wherever you travel. That might sound philosophical for a site-seeing outing but when you take Islam with you, make good memories (clean memories!) and leave a better person, that was a trip worth taking. Allah says "so travel the earth", go check out the places, see how Muslims are living. I've my heart set on Ireland & Africa. InshaAllah. The Eye photos are cool too, will have'em up soon ia. I dunno why BBC reporters pronounce it Obamar, Londoners, what dyu expect? 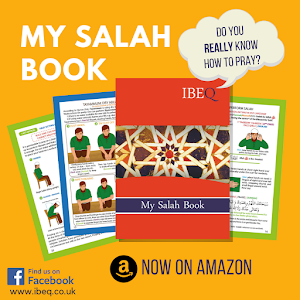 Wasalam`alaykum warahmatullah. Make du`a for us all! Totally agree with those 3 points. Jazak'Allahu Khairan for the reminder as well. Ireland and Africa - nice choices. I've got too many to list in Europe/Africa/Asia. :: Likewise. We'll want to see those duas on Judgement day! Allah knows we need'em. May Allah subanahu wa ta`la, ya rabb, receive all the fierce Muslims with pure enough hearts to get into Jannah ia.